HomeWhat drives carbapenem resistance? Carbapenem use, stupid! On the one hand this is not very surprising. But the study design is neat and convincing, and the study opens the door to using surveillance of antimicrobial use as a real-time tool for predict outbreaks. How would this work in practice? You set up an “alert level” of carbapenem use, and if this is exceeded, launch an urgent campaign to return carbapenem use to “normal” or risk an outbreak? The team then evaluate the impact of an antimicrobial stewardship intervention control an outbreak of OXA-48 K. pneumoniae in a renal unit. Whilst the impact of the intervention is clear, I’m not convinced this is all about antimicrobial stewardship. The intervention also included ‘case isolation, screening of contacts, barrier nursing and other infection control interventions’. I accept that the increase in meropenem use immediately prior to the outbreak is convincing evidence that the demonstrated reduction in meropenem use was an important part of bringing the outbreak under control, we can’t rule out the other aspects of the bundle. The interrupted time series analysis used in this study is a powerful tool, but I would like to see how a “breakpoint model” approach would have looked within this analysis (where the breakpoint is not specified a priori – you allow the model to tell you when the significant change in rate occurred). 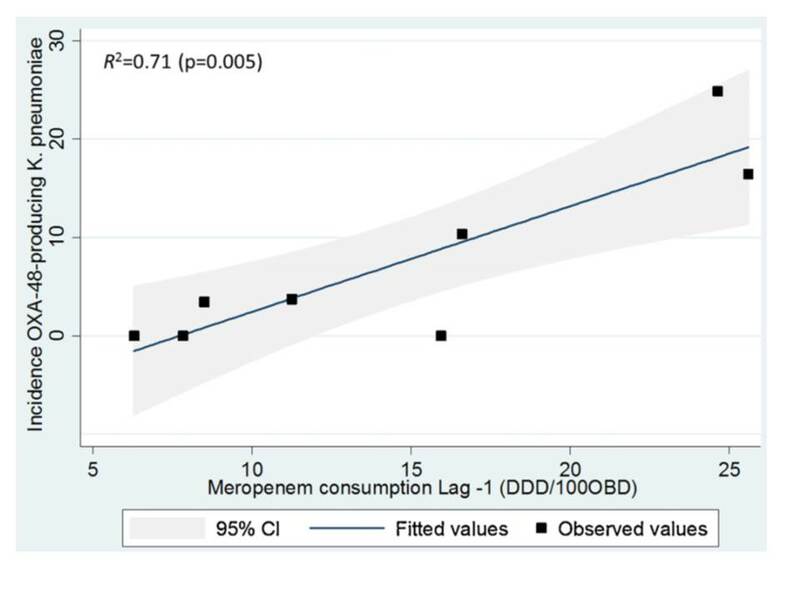 Also, was there any correlation between carbapenem use and carbapenem resistance in other Enterobacteriaceae or in non-fermenters, such as A. baumannii? Perhaps (hopefully!) these were too rare to analyse. So, what drives carbapenem resistance? Carbapenem use, stupid! But of course, it’s not this simple. Antibiotic use provides the selective pressure giving resistant strains the chance to out-compete their sensitive counterparts. However, poor infection control practice will accelerate the problem massively. And will also mean that you will also continue to see problems even with tight antimicrobial restriction. Keep the forehead-slapping hand ready, and think about how through this ever-growing mass of evidence that “use = resistance” (all that we can change is the speed) there are still people that don’t think we need new antibiotics. I hope their numbers are dwindling. It’s like saying we don’t need more oil if we make our cars more efficient. Yes, like they say above, infection control, stewardship, vaccination etc. are all important, but if you want to use antibiotics you need to make new ones, it’s that simple. Their genes will outwit our drugs sooner or later. Very useful rant thanks. Yes we need more antibiotics but we are running out of targets. All major bacterial structure and function covered so need to be creative to make genuinely novel agents (eg carbapenemase inhibitors)! Studies have found carbapenem resistance in Enterbacteriaceae and Acinetobacter (including OXA-48 producing E. coli and K. pneumoniae, see http://www.sciencedirect.com/science/article/pii/S0378113514000753) species in pigs, poultry and cattle, as well as domesticated animals and even birds and ecotoparasites associated with farm animals. While such reports are isolated, there have already been a surprising number of them, though none so far in the UK. For a comprehensive picture see for example http://www.efsa.europa.eu/en/efsajournal/doc/3501.pdf. Carbapenems are not licensed for use in veterinary medicine, which raises the question of how these resistance strains have arisen? One of the postulated explanations is that resistance genes initially spread from hospitals to farm animals via the environment and sewage effluent. One study noted that a sewer ran close to a large intensive pig farm where carbapenem resistance was identified. Other studies have suggested that river water contaminated which sewage effluent used to irrigate farmland could be a source of resistance on food, and carriage in farm animals. Such horizontal gene transfer would be unlikely to persist and spread in the absence of selection pressure. But one of these studies also notes that co-resistance with tetracyclines, aminoglycosides, quinolones and cephalosporins could allow these antibiotics (all used in livestock production) to co-select for carbapenem resistance. If this is correct does this not also suggest that other antibiotics, apart from carbapenems, could be a small but perhaps not insignificant part of the problem in human medicine too? Whether or not that is the case it seems to me that we also have to remember the carbapenems have only seen increased use over the last decade due to the rise of multi-drug resistance and in particular the emergence of ESBL resistance in E. coli, salmonella and some other bacteria. While there are no reliable estimates of the relative contribution of medical and veterinary use of modern cephalosporins in giving rise to ESBL genes in resistant infections, there is no doubt that farm animals and from them food and the environment, have become significant reservoirs. This can be linked to the past use of 3rd generation cephalosporins in poultry production and their continuing use in pig and dairy production today. Where carbapenem resistance emerges in farm animals we also have to recognise that food and environmental spread could become additional sources of resistance genes in humans. That must be an specific concern given that five colistin preparations remain licensed in the UK for oral use in adult cattle, calves, adult sheep, lambs, pigs, chickens and turkeys. We must hope that carbapenems never have and never will be prescribed for animals, though under the ‘prescribing cascade’ veterinary surgeons are permitted to use many antibiotics reserved for medical use if no other effective antibiotics are available. And since there have now been cases of swine dysentery resistant to all licensed veterinary antimicrobials, where producers can face large financial losses, we should be open to the possibility that in countries with poor regulatory systems such use might not be an impossibility. All of which suggests to me that to help contain the rise of carbapenem resistance we have to recognise more fully than is currently the case, the two-way interactions between medical and veterinary use of antibiotics, as well as urging (and helping where necessary) all countries to develop robust regulatory systems for antimicrobials in both humans and animals. Stuart Levy was/is ahead of his time by far (1976) showing the multiple resistance link in chickens from the use of one antibiotic only (tetracycline use only, x5 antibiotic groups became resistant) then its spread to associated farm workers who did not eat the eggs or poultry. And how the more multi resistant isolates were, the more rapid their resistance gene transfers were. This at a time when resistance was relatively rare, and new antibiotics coming to market was plentiful. Stuart B. Levy, M.D., George B. FitzGerald, Ph.D., and Ann B. Macone, B.S.